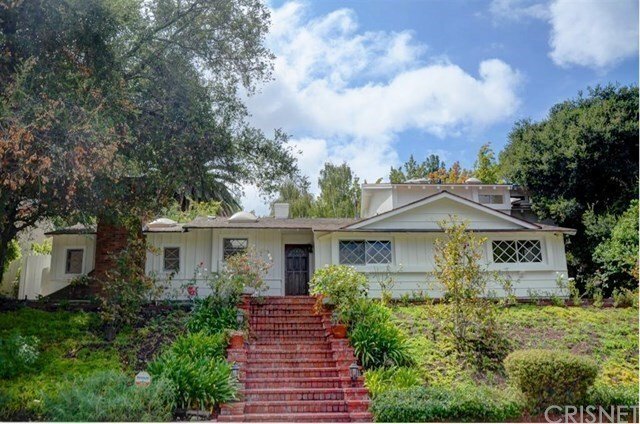 Elegant traditional perched in the heart of the desirable Royal Woods of Sherman Oaks. 4 BR and 3 Baths pool home. Beautiful living room with dining area. Wood floors throughout except for the kitchen that has slate tiles. Three fireplaces in Living Room, Master Bedroom and in the large Family Room. High ceilings and bright Family Room with skylight. Cozy breakfast area looking to the backyard thru the French windows. Updated and large kitchen features granite counters, new stainless steel gas stove and dishwasher. Master bedroom suite has a private study with fireplace, with large walk in closet, and bath with dual vanities, glass shower and jet tub. The backyard boasts a pool and spa. Lush landscaped yard. Easy access to the 405 and 101 freeways. Gardener and Pool maintenance are included. Tenant is responsible for DWP, Gas and Cable. Available on or around 05/10/2019.